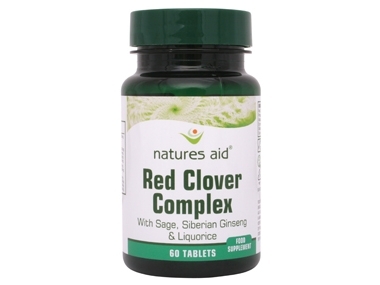 Each tablet of Natures Aid Red Clover Complex with Sage, will provide on average Red Clover (Trifolem pratense) 250mg of extract providing 20mg of isoflavones. Sage (Salvia officinalis) extract equivalent to 200mg of dried leaf standardised to provide 1.6mg of rosmarinic acid. Liquorice (Glycyrrhiza glabra) root extract, equivalent to 200mg of root powder and standardised to provide Hmg glycyrrhizinic acid. Siberian Ginseng (Eleutherococcus senticosus) extract, equivalent to 200mg of root powder typically providing 106µg eleutherosides. Red Clover Extract, Microcrystalline Cellulose, Di-Calcium Phosphate, Liquorice Extract Prep. (Liquorice Root Extract, Maltodextrin, Silicon Dioxide), Sage Extract, Siberian Ginseng Extract Prep. (Siberian Ginseng Extract, Maltodextrin, Silicon Dioxide), Anticaking Agents (Silicon Dioxide, Vegetable Source Magnesium Stearate). Click the button below to add the Natures Aid Red Clover Complex with Sage 60 Tablets to your wish list.